I discovered an awesome, gorgeous, yet dangerously fabulous spiked heel the other day. 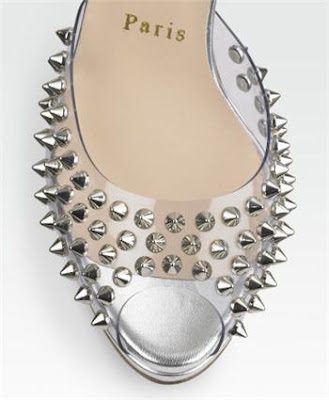 I'm so in love with the Jeanette Spiked Heel by Christian Louboutin below. I like the aesthetic appeal of the spikes against the leather upper and silver lining. The shoe has a 1/2 inch platform so it'll help with any potential pain from the 4 and 3/4 inch heel. Signature red sole obviously included. Alas, the price tag defeats me again.....oh well. I don't mind watching and waiting. The sale items come faster than you expect these days.